Get Vendio Gallery - Now FREE! Gorgeous Antique European 26 Tea or Serving Tray, Ornate Figural Inlay, Musical. 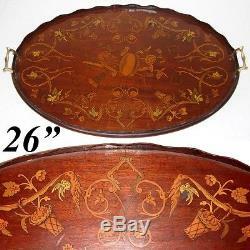 Gorgeous Antique European 26 Tea or Serving Tray, Ornate Figural Inlay. All items and photos are the express property of Antiques & Uncommon Treasure. No reproduction without prior written consent. We'll be sending out sale notices and special deals to our'Favorites' customers. Absolutely gorgeous antique European Victorian to Edwardian era 26 wide serving or tea tray, Italian style colorful figural marquetry inlay including cherubs or putti, musical instruments, brass or bronze handles and in wonderful condition! These marvelous old serving trays make both superb pieces serving their original purpose but also visually appealing decorative pieces. Great do use as intended but also wonderful to display a fine collection of decanters & barware, a great old sterling silver tea set perhaps or even hung on the wall as the works of art they really are. Multi-colored inlays covering the expansive surface of the tray. Cherubs or putti figures, birds and ornate scrolls with baskets and the center with musical instruments including flute or clarinet, tambourine, harp and flowers. All in exotic fruitwood inlays in what appears to be a rosewood or mahogany veneered panel. The entire oval tray is framed in a shaped solid wood bordering and has heavy solid brass or bronze side handles. Wonderful condition, too, as you can see. Very good to excellent condition. There are thin veneer spit or two visible around where the handles are attached through the tray. Some slight surface scuffs to the finish but no real notable damage, no repairs. There is one or two small chips to the outer vertical framing/edging. The base is covered in a green felt fabric that appears to be original but I can't be certain. I did remove the side handles to polish them and they have the original old rounded bolts holding them in place. We're easy to deal with. Our fine inventory is very important. And your ranking of our performance is also very important! We wish to keep our 4.9 - 5 star ratings in all categories. We always insure our items BUT, more importantly, pack them extremely well knowing that most are not replaceable. Please remember that when leaving DSR ratings. Icon here or above to see more of our inventory, offerings and venues. We have a HUGE assortment of the finest antiques to be found online, all at your fingertips with Antiques & Uncommon Treasure. _gsrx_vers_631 GS 6.9.8b6 (631). The item "Gorgeous Antique European 26 Tea or Serving Tray, Ornate Figural Inlay, Musical" is in sale since Friday, January 27, 2017. This item is in the category "Antiques\Decorative Arts\Woodenware\Trays". The seller is "antiquesuncommontreasure" and is located in San Marcos, California.